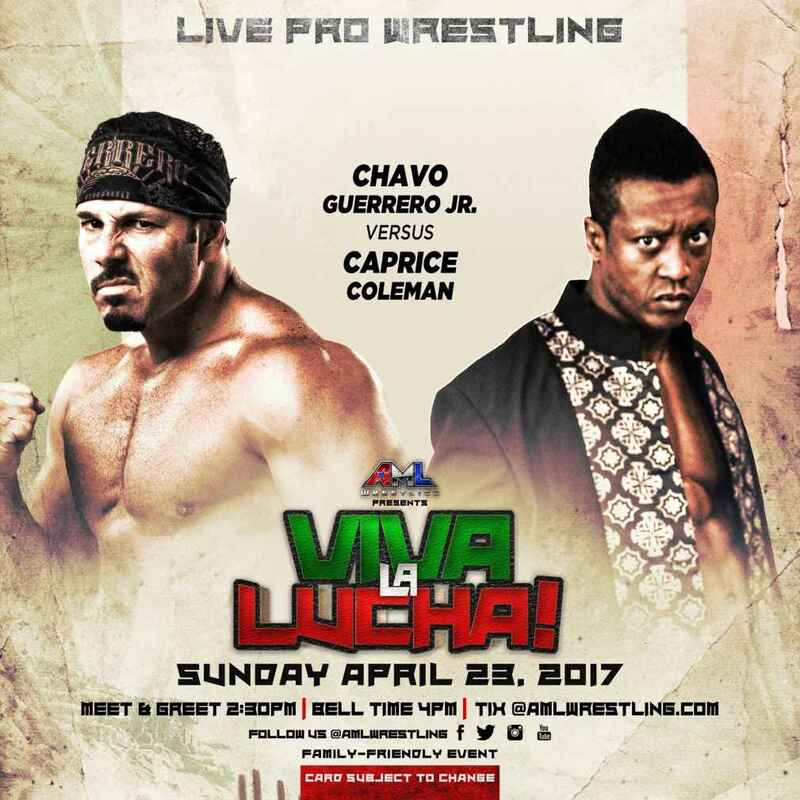 Here are the OFFICIAL RESULTS of AML Wrestling Presents: Viva La Lucha, which took place April 23, 2017 at the National Guard Armory in Winston Salem, NC. WHITE MIKE versus DANTE CABALLERO. White Mike pinned Dante Caballero after The Raticopter. This match pitted the red-hot White Mike (who was on the "Future Stars Of AML Wrestling" roster as recently as six months ago) against newcomer Caballero. After an entertaining match, Mike was able to lock Cabellero in his Can Opener swinging neckbreaker finisher that he calls The Raticopter and was able to hold the AML Wrestling newcomer for the three-count. THE HEATSEEKERS (Elliot Russell and Matt Sigmon) versus DA POWAH (Big Time Yah and Ian Maxwell). The Heatseekers defeated Da Powah when Sigmon used a foreign object to knock out Big Time Yah while the referee was distracted. Da Powah had been a thorn in the Expendables' side in the last few months, and they wrestled a good match against the former champions, but the underhanded tactics of Sigmon, Russell, and manager George South was too much to overcome. BILLY BRASH versus "THE PAIN TRAIN" PRESTON QUINN. Billy Brash pinned Preston Quinn after a knee lift. Two veterans collided in a match that featured two throwbacks- Brash, whose brazen tactics had the fans howling, and Quinn, the respected elder statesman. An even match went back and forth for 12 minutes before a running knee lift by Brash was enough to secure the pinfall. TIMMY LOU versus WILLIE MACK. After a thrilling match, Timmy Lou pinned Willie Mack after a flying body attack. This bout pitted "Mr. 500" against one of the toughest men from Lucha Underground. This was an entertaining see-saw affair that had ringside observers wondering about the futures of both men. Retton's victory likely puts him in the AML Wrestling title picture, but that certainly doesn't take anything away from Willie Mack. His AML Wrestling debut thrilled the crowd. After the match, the crowd gave both performers a standing ovation. THE GEORDIE BULLDOGS versus THE DIXON LINE (Ken Dixon and Joe Keys w/Robert Locke) for the AML Wrestling Tag Team Championship. The Geordie Bulldogs successfully defended the AML Tag Team Championship by disqualification when Joe Keys was caught using "banned" mist by senior official James Hunter.. The Bulldogs were mistakenly disqualified by in-ring official Ben Grayson before his supervisor Hunter came down to ringside to overrule him. In the ensuing chaos, Ken Dixon cold-cocked Mark Denny with one of the AML Tag Team title belts, rendering Denny motionless and unconscious. Denny was revived and helped backstage by Sean Denny and ringside personnel, but the initial diagnosis was a concussion. Mark Denny is likely out of action for 4-6 weeks. ZANE DAWSON (w/ GEORGE SOUTH and the XPENDABLES) versus BIG SEAN STUDD. Zane Dawson was able to retain the AML Wrestling Championship thanks to outside interference from Matt Sigmon to defeat a game Sean Studd with a pinfall victory. Studd replaced Jax Dane on the card who had an opportunity to wrestle with Impact Wrestling this week, and the son of Big John Studd gave Zane Dawson all he could handle before the numbers game cost him the win. CAPRICE COLEMAN versus CHAVO GUERRERO, JR. Caprice Coleman pinned Chavo Guerrero, Jr. after a sky splitta at the 22 minute mark to win a special challenge match. Coleman called this a "dream match" leading up to the event, and both men thrilled the crowd with an excellent match. Coleman had Guerrero well-scouted, blocking both his vaunted tornado DDT and the Lasso from El Paso before getting the advantage and hitting the sky splitta for a clean pinfall.